It all began in April 1994, when the Hutu government in Rwanda decided that the minority Tutsi tribe was a threat and should be wiped out completely. 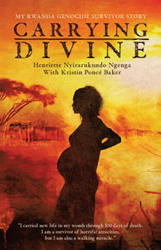 Henriette Ngenga was twenty-eight years old and pregnant with her fifth child, a baby girl named Divine. This young Tutsi mother was facing a government-mandated massacre with four children between the ages of one and eight in her care. Hunted by men with machetes, tortured in a prison, and beaten savagely, she felt her daughter writhing from starvation inside her womb, while privately rejoicing that there was still any movement at all. This is one mother’s story of love, terror, faith, and survival. Every word in Ngenga and Baker's book is true – a compelling story that no reader will soon forget. “We want readers to know that no matter what the outward circumstances or trials of this life bring, no one can take away the divine faith carried with you wherever you go,” state the authors. Henriette Nyirarukundo Ngenga is an exuberant and kindhearted mother of eight who currently resides in South Bend, Indiana with her husband, Innocent, and two daughters, Brunelle and Nadine. She works for the University of Notre Dame and dreams of being able to travel and share her story with the rest of the world. She hopes that one day she will be able to return to Rwanda to open a center for women and children in need. She recently founded Abundant Life Global Outreach Foundation and is eager to see what God has in store for this next chapter of her miraculous life. For more information, please visit https://www.facebook.com/CarryingDivine. Xulon Press, a division of Salem Media Group, is the world’s largest Christian self-publisher, with more than 15,000 titles published to date. Retailers may order Carrying Divine: My Rwanda Genocide Survivor Story through Ingram Book Company and/or Spring Arbor Book Distributors. The book is available online through xulonpress.com/bookstore, amazon.com, and barnesandnoble.com.